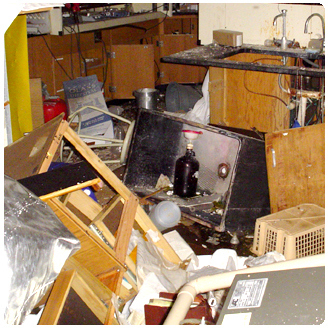 "...survived a university lab explosion intact"
Our ECO Funnel® survived a university lab explosion completely intact and was documented in the photo to the left by a lab worker. Though the lab sustained enormous damage, the waste container remained closed, containing the volatile solvents inside and preventing a possible fire. ECO Funnel® is a powerful tool for maintaining safety in the workplace. I wanted to say thanks for the excellent customer service I received from you and your company. It is so very nice to work with a company who stands behind their products as CP Lab Safety does. Thank you for being first class. I will definitely keep recommending your products." ...an ideal containment system... "The Safety ECO Funnel is an ideal containment system that eliminates the danger of ignited vapors and spills from open chemical waste containers." "The ECO Funnel has helped us meet environmental regulator requirements while at the same time provide added protection of spill prevention from handling operations and waste streams from equipment." "The Safety ECO Funnel is really such a simple and elegant solution to these types of problems" "I recently joined a company with a serious emphasis on chemical hygiene and safety, which was also my introduction to the use of Safety ECO Funnels. In a previous lab, I was a hazardous waste manager and often needed to address problems such as losing gels or stir bars into our hood waste and the common occurrence of forgetting to close the waste when not in active use. The Safety ECO Funnel is really such a simple and elegant solution to these types of problems; its filter and easy one-handed closure promote efficient waste disposal without the usual mess and spills. I think it is a duty of all labs to ensure that they are both compliant with regulations and environmentally conscientious, and I commend your ECOlogically responsible product design. When I return to school and begin my own research, I will be sure to use a Safety ECO Funnel in the lab." ...[The Solid Waste Container] is a good quality product... "I received the solid waste container and bags. I have been using it for a couple of days and found that it is a good quality product. My recommendation to EH&S will be to have every chemist use the product." ...we made it mandatory for these funnels ... to be used ... "The reason we like your ECO Funnels is because they serve well as waste funnels/containers and satisfy the EPA since they have lids. Many of us used to just use an old 4L solvent bottle with a plastic funnel on top. Rarely was the funnel removed and it was left open to the air. A few years ago, we made it mandatory for these funnels and waste bottles to be used." "I am writing you regarding one of the products sold & (I believe) manufactured by Cal-Pac Lab Safety- the "ECO Funnel." I've been managing a synthetic organic chemistry lab here at Scripps for ten years now. During that time one of the critical "safety" issues that we have been repeatedly challenged with is the management of our organic solvent waste. The main area of concern, to our internal safety specialists, and the city and county officials who occasionally come to inspect our labs, has always been the use of waste solvent collecting containers in or near our sinks. As I'm sure you are aware, chemist use (and reuse) a great deal of specialized glassware in their research. That glassware needs to be thoroughly cleaned between uses and this is typically done at a sink using soap and water. It is also common practice to then rinse washed glassware with some organic solvent, usually acetone, in order to remove any remaining moisture from the glass and facilitate drying. Most chemistry labs that I have seen place their glassware drying racks near the sink and so it seems logical that the organic solvent rinse of glassware is most commonly going to take place…guess where… near the sink. Of course, nobody wants organic solvent waste going into the sink or the city sewer system and thus you have the ubiquitous "solvent-waste-container-in-the-sink" problem. Safety specialists, including the Fire Marshal, have been asking us for years to completely remove any organic solvent containers from our sink areas in an effort to remove all possibility of solvents reaching the plumbing. However, they seem to realize the "convenient" necessity of this practice and have grudgingly allowed us to continue it as long as we are making obvious efforts to choose the right type of container in which to collect and store waste solvents (on a temporary basis). Through the years our safety "advisers" have changed their mind several times about what constitutes an "acceptable" solvent container. We have devised several versions of funnel/container systems for our lab in an ongoing attempt to make them happy. Unfortunately, there was always some aspect of our design with which they found fault - plastic containers will melt in a fire, uncoated glass containers can break, ordinary funnels do nothing to contain harmful vapors, etc…. Even commercially available safety cans with spring loaded/vented caps are impractical for our use since most chemists will simply prop the cap (permanently) open with a funnel thus defeating the intended purpose. Your ECO-Funnel (particularly catalog (EF-3004B) is currently one of the only products we have found on the market that comes close to realistically addressing both genuine safety concerns and issues of practical use. The wide-mouth funnel provides maximum capture of solvent spray, the flip-top lid is convenient enough that most chemists can (be trained to remember to) close it, and the fact that it fits a common 4L plastic-coated glass bottle allows us to monitor the fluid level while also providing a container size adequate for temporary solvent storage in or near typical lab sinks and fume hoods. As you know, we have purchased several ECO-funnels in the last couple of years and they are currently in use not only in our lab, but also throughout our Institute with the blessing of our safety specialists and the Fire Marshal. Since these funnels are the only common mutually agreeable solution available to date, we intend to continue buying from them. We believe you have your hands on a common sense, extremely useful product that will become a desired tool in laboratories everywhere. We congratulate you on a GREAT product idea! I wish you the best of success in your future." ...we have been able to satisfy... our dental dealers with special needs... "I want to thank you for the great service and recommendations that you have made to assist us in our purchase. With your expertise, we have been able to satisfy two of our dental dealers with the special needs that they presented, both being oral surgeons. Incorporating your ECO Funnel to our mercury separator/collector has become a topic of conversation with in the dental industry and makes Rebec, once again, the cutting edge manufacturer. I will enclose under separate cover some glossy prints of our application of the ECO Funnel into our system. Again, thank you for your assistance and I am looking forward to our future communications with CP Lab Safety." ...you make the whole process so easy..